Becoming more productive can make a dramatic difference in your work, sales success, and overall happiness. Think about it. How do you feel after a day where you've been exceptionally productive and pushed important projects forward? You feel invigorated, motivated, engaged, and ready for the next challenge. Compare that to an unproductive day where you couldn't focus or spent the entire day working on tasks for others. You feel drained, overwhelmed, frustrated, and irritable. The good news is you can control how productive you are and in turn how you feel at the end of each day. Through our work with clients, extensive research, and our own proprietary Extreme Productivity Assessment, we've developed a productivity system made up of the 3 Keys, 9 Habits, and 27 Hacks of Extreme Productivity. 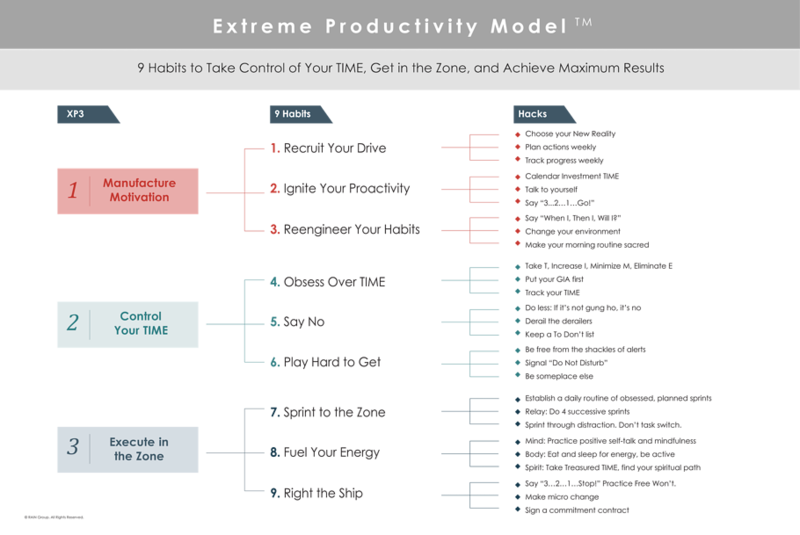 The system of driving extreme productivity through the application of the 3 Extreme Productivity Keys (XP3) and 9 Habits to manufacture motivation, take control of your TIME, and maximize focus and effort. In the Extreme Productivity System (XPS), each of the 3 Keys is comprised of 3 habits, which in turn have 3 hacks, making the system easy to apply. Say "When I, Then I, Will I?" Sprint through distraction. Don't task switch. Download this image, print it out, and hang it in your work area. This is a great reminder and will help keep you focused. Individuals and sellers who adopt the Extreme Productivity System and make it part of their daily work habits have been proven to achieve maximum results. To learn more about these keys, habits, and hacks download the ebook, The 9 Habits of Extreme Productivity.